Back in the 70's and 80's, Avondale, one of Birmingham's oldest districts, was a dying community. The older people, who once called the community on the eastern side of Birmingham home, were dying off and the neighborhoods of Avondale had become run down and seedy. It was known more for the drug deals that took place there rather than the Big Spring that once brought people to the area. Avondale and its Big Spring, from which bubbled the "sweetest waters" and inspired a park that, for a time, housed the beginnings of the Birmingham Zoo, soon found themselves victims of neglect. Recently, all of that has begun to change. A new generation has discovered Avondale, and younger people and creative businesses are starting to find their way back into the area. The turnaround began late in 2011, when Avondale Brewing set up shop in the four block area. Six months free rent was offered to other businesses who could move into the area and help increase foot traffic. Freshfully Market, now closed, began selling local produce and other goods made in Alabama. Saw's Soul Kitchen, with their unique take on barbecue and soul food, also joined the party. Now, less than five years later, Avondale has become Birmingham's trendiest neighborhood, with a vibrant restaurant and bar scene. In 2014, the food truck, Melt, found a brick and mortar home in an old service station in Avondale, and added their own cheesy goodness to the mix. 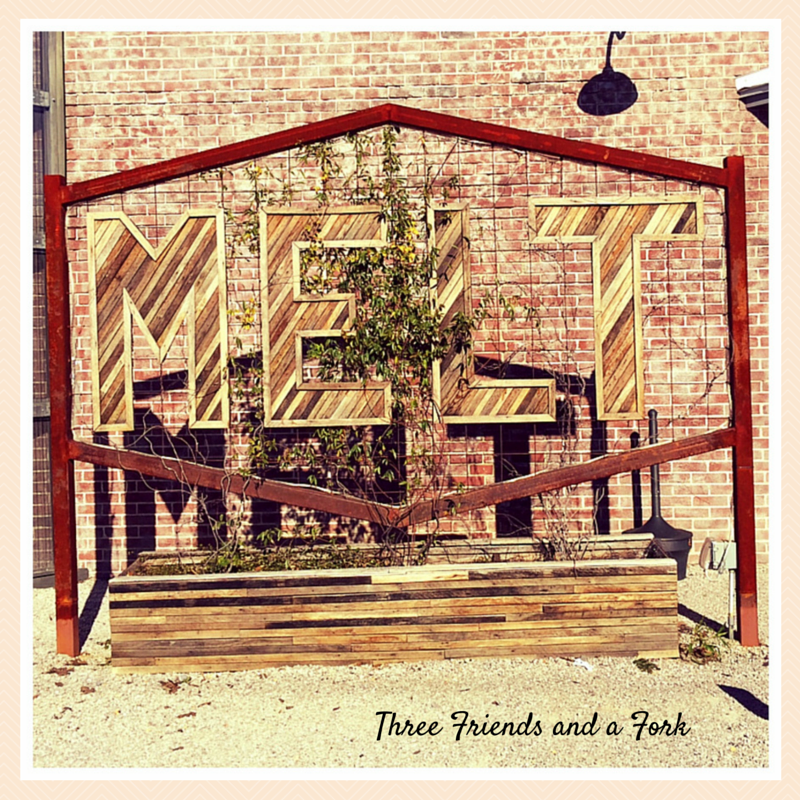 I will admit, I was a little hesitant when I first heard about Melt. I like cheese, but I am one of those weirdos who believe a little cheese can go a long way. Too much and I have a headache. I was afraid a restaurant with a cheese centered menu would induce a migraine. But eventually, my curiosity got the better of me, and I found myself headed to Avondale once again. First, I was impressed with the funky, reclaimed decor. Lots of old wood and tin, found objects and high ceilings give the place a fun, laid back vibe. We found a seat in one of the roomy booths, were greeted promptly and received our menus. I was happy to see that everything on the menu wasn't swimming in cheese. There is cheese, for sure, but it doesn't overwhelm the menu as I thought it might. First up, appetizer. We chose, well my daddy quickly suggested and the rest of us went along with, fried pickles. I have to say, I was glad we did. Daddy thought, and we agreed, these were the best fried pickles we have had. To begin with, the long slices make them perfect for dipping into the creamy, spicy roasted jalapeño ranch dressing. Secondly, they were completely free of grease, which seems to be a problem for most fried dills I have tasted. These were crunchy and delicious. Things were looking promising. Daddy chose, Ma! The Meatloaf which came with house made meatloaf, garlic mashed potatoes, Monterey jack, grilled onions, and rosemary ketchup, served up on Birmingham Breadworks sourdough. Daddy liked the sandwich, but he is old school. He would have preferred his mashed potatoes on the side, rather than on the sandwich. He chose Melt's homemade chips to accompany his sandwich. We all agreed those chips were delicious. My mom decided on the Roast Beef Melt with shaved roast beef, Monterey jack, horseradish aioli, arugula, and shaved red onions on Birmingham Breadworks sourdough. She liked her sandwich, but, in a weird reversal of tastes, she would have liked MORE cheese. You just can't please our family! She also enjoyed the hand cut fries. As for me, I couldn't resist the tomato basil soup and chickpea hummus with kalamata olives, lavash crackers and toasted na'an bread. I am always searching for a perfect tomato basil soup and this one was pretty darn close. It came with a delicious puddle of basil infused olive oil which made a wonderful topper. I loved it. I also loved the creamy hummus with its happy sprinkling of paprika. I wish I had some right now. So, now I have a new favorite restaurant in Birmingham and I just keep coming up with tasty reasons to head back to Avondale. Three Friends and a Fork give Melt 3 Perfectly Cheesy Yums UP! I think the Pink Suit of Armor is giving a Yum UP as well!